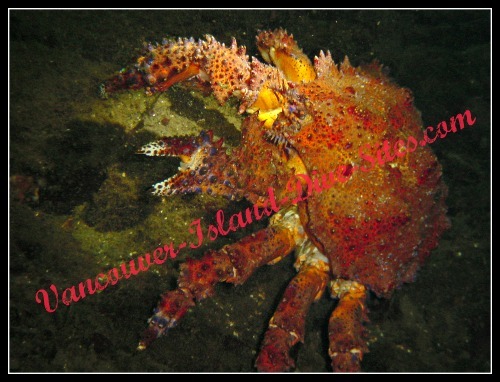 Yeo Islands off of Nanoose Bay by the Schooner Cove Marina has an amazing dive, suitable for those with an appropriate level of experience. This is a boat access dive with a stepped bottom contour that went down over 100ft (30m). We went in from the side facing east, anchoring about halfway along the island in front of a nice beach (which meant we were looking towards the Winchelsea Island group). What wind there was came out of the northwest allowing the islands themselves to give us a nice sheltered spot to drop our anchor and prepare to dive. The tide was also near high slack, giving us a mild current that made for some easy navigation. In the shallows we came across Giant Nudibranchs and Sea Urchins, then as we progressed deeper down the steps there was what appeared to be a cluster of bones which was likely a Seals final resting place. Deeper yet hundreds of Brittle Stars and sea cucumbers hung in clusters while yet even more Urchins continued on down. Feather Stars clung along the steep walls at around 60-80ft waving in what appeared to be a breeze, while amongst them, large and colorful Puget Sound King Crabs basked on the rocky shelves while waiting for their next meal. The visibility was excellent for a summer dive and as a boat dive the site was pretty much untouched except for some seals that live out on the rocks at the Northern end. The nice piece of beach we anchored in front of looked like one could pull up a small boat on, and from there a short walk across the island would allow you to try the other side of the island as a second dive, though at this point we have not done it. According to a marine chart the other (west) side is a doable dive with the depths a little shallower and the slope much more gradual. Based on the chart I believe the prime diving terrain is definitely on the east side where my buddy and I dove. If you do the other side please feel free to share your experience at my page called "Share Your V.I. Story"
Either way, this was a very enjoyable dive that one could consider available to all those with an appropriate skill level. It was also a beautiful, secluded and untouched dive site as well. Enjoy and dive safe, cheers!